Booked hotel only to be told no room at the inn. 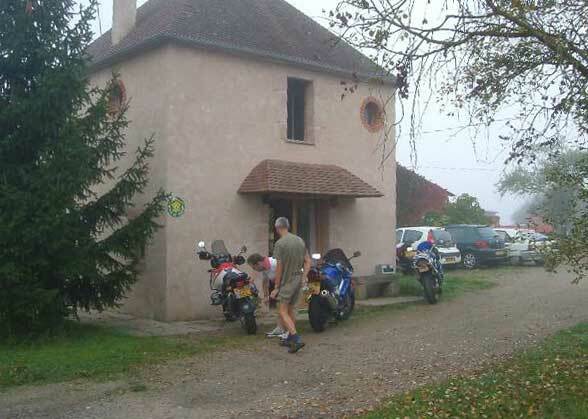 Took me ages to find somewhere to stay but I found a gîte not too far from circuit, 220 euros for three nights, not bad eh! Went overnite on ferry to Caen, weather was good, got thrown off ferry about 0700 into Caen rush hour. Great, ended up on wrong road, oops. Had about 350miles to do, so off we set at pace, just me and Tel. Got to gîte about 1700 stopping for lots of coffee on way. 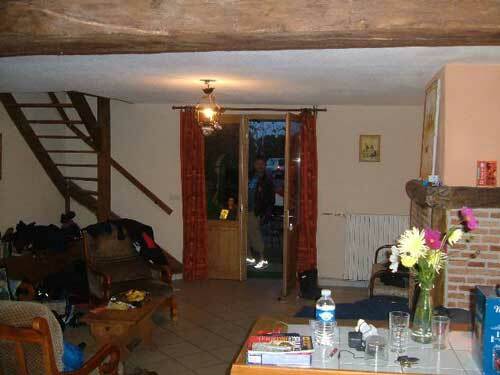 Nice gîte, sleeps 10. Me and Suz got bedroom with shower. Did do a bit of greenlaning to find it, not a good idea on loaded gixer. Got settled. Me and Tel went for provisons (beer), oh, and some food (crisps). Dark by the time we left supermarket, got lost going back to gîte. Oops! Looks strange at night, the girls said they could hear us going round and round. Ian and Wolfie joined us much later after opting to go via paris. MISTAKE! Grandstand was next to start, entry to paddock, duke cap and a few other things - good value! Spent Sat at practice and superpole, brilliant! 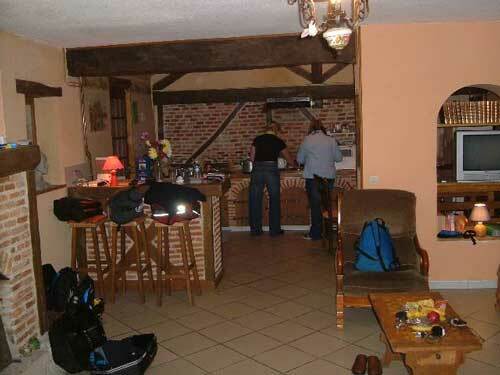 Had cracking meal on way back to gîte at hotel full of pissed locals (rugby fans). Up early Sun for trip to circuit in thick fog, cold as well. No practice, no racing, just thick fog. 1st SB race at 12, with 15 mins to go fog started to lift, yippee! Good first race but not good for Toseland still needs points to win world champs. 2nd race toseland has it all to do, last 5 laps of race crowd is silent and tense but he does it yippee! Back to gîte for supper, off down dual carrageway in outside lane when oops, fuelstop, brakes hard on, exit right into services, BMW up my backside VFR flys past on hard shoulder stopping about 10 metres past entrance to services oops gsx follows up few mins later. Drunk all the beer and wine, ate all the grub ready for early'ish start to ride to Cherbourg for ferry 400+ miles via Paris. Left 9:30. 90+ all way, short stops, two crashes on road near port, made it with 20 mins to go. We were not last on boat. Knackered for a few days after but worth it. Rear tyre looks like a speedmaster now.